‘Remarks on Walter Benjamin’s Critique of Violence’ by Anthony Auerbach, paper presented to the seminar After 1968, led by Katja Diefenbach, Jan van Eyck Academie, 2007. Walter Benjamin, ‘Zur Kritik der Gewalt’, Archiv für Sozialwissenschaft und Sozialpolitik, 47 (1920/21), pp. 809–832. Page numbers in brackets refer to ‘Critique of Violence’, trans. by Edmund Jephcott, in: One-Way Street and Other Writings (London: NLB, 1979). because the police would not allow it. In the following comments on Walter Benjamin’s ‘Critique of Violence’ I would like to give a brief synopsis of the main points of his argument and to amplify some of the hints dispersed throughout the text, that is, with additional hints rather than a full explanation. But first I would like to consider the motivations of this text, which was, at the time of writing, almost completely deprived of readers. Not only was the manuscript rejected by the editor who originally commissioned it, but Benjamin’s discourse took place outside of any academic or political community and was circulated among some of Benjamin’s friends, who didn’t necessarily speak to each other about it. Benjamin’s writing would therefore merit the designation ‘meditation’ on violence. I perceive two motivations whose relationship in the text could be described as perverse, given the seemingly divergent demands they would make on the writer. On one hand, Benjamin aims to provide a prolegomenon to the transcendental critique of violence: a metaphysical enterprise on the Kantian model. On the other hand, Benjamin aims to come to terms with his own situation in Germany in the aftermath of the First World War. The first mobilises an almost parodic amalgam of philosophical, juridical and theological abstractions which is interrupted by a series of references, mobilised by the second motivation, to the recent war, constitutional turmoil, general strike, failed revolution, parliament and police. These interruptions lend urgency the task of discovering or constructing a standpoint for the critique of violence ‘outside positive legal philosophy but also outside natural law’ (134) and moreover suggest what is at stake in the ‘historico-philosophical’ view of law. Benjamin’s critique thus neither advocates, condones nor rejects violence, but begins with a fundamental assessment of the paralysis of the dominant trends in the discussion of violence, pointing out how opposing sides of the debate both lead to contradictions because they share terms which are accepted as axiomatic, but which are not in fact independent. Benjamin argues that it is not possible to separate violence from law; that all violence is either law-making or law-preserving; that all law, however remote it may seem from its origins and from the forces which maintain it, is latent violence. Therefore it is violence itself which decides what violence is justifiable for what ends. This circle defines violence self-evidently as a natural means of achieving natural or legal ends. The power established by law-making violence threatens the law-breaker with law-preserving violence. But this threat is subject to fate, because the criminal might not get caught, and his or her ‘violation’ of the law threatens to become in turn a law-making violence and thus a challenge to existing power. However, if it is not just a matter of getting away with it at an individual level and the challenge to existing power is self-conscious and victorious — as in a political revolution — then the contest can only begin again. Benjamin characterises this as a mythical cycle bound to endless repetition like the mythical punishments — or perhaps bound to violent tautology as in Kafka’s penal colony where the punishment consists in the mechanical inscription of the law on the body of the guilty victim. These are the cycles of repetition which constitute history as a series of disasters prompted by fate and which at all costs must be stopped. Here, what is at stake in philosophical history becomes a personal risk. In ‘Critique of Violence’ Benjamin proposes what he calls ‘pure means’, that is, means without ends. For it is the logic of ends which powers the mythical machine. Benjamin acknowledges possible forms of non-violent resolution of potential conflicts between people, but these are immaterial because the are not legal, and as soon as they would be codified by legal contract or treaty, would again be subject to force. Benjamin locates his answer to such insoluble problems in the crossing of the idea of a ‘proletarian general strike’ which he gets from Sorel and the idea of ‘divine violence’. I’ll come to divine violence in a moment. First, I think it would be a mistake to put too much emphasis on ‘proletarian’ in Benjamin’s use of the term and thus lend it a more direct relation to Marx that it really has. What is important for Benjamin is not the proletarian as such but the distinction Sorel makes between what he called a ‘proletarian general strike’ and a ‘political general strike’, the latter being a form of violence intended to extort concessions for workers from the bosses, but without fundamentally changing the relationship between them. The hypothetical proletarian general strike on the other hand makes no demands other than the complete transformation of social relations and of work itself. It announces only the intention of abolishing the state and its powers, not of usurping them. Benjamin regards this strike as ‘pure means’ and therefore not violent, even though the strike action itself (that is, not working) is the same as a violent extortionate strike. It is not violent because its ends are, at least from the point of view of a pragmatist, radically senseless, unreasonable and extravagant. Its only intention is non-participation in the logic of ends and means and a refusal of mythical imperatives. This intention is perhaps the seed of its metaphysical failure, certainly enough to provoke violent suppression by existing powers. Clearly, this strike signals a utopian ambition or messianic hope which Benjamin might share with Marx. Benjamin’s messianism consists in the demand that everything must be different, and moreover that there is work for him personally to do in bringing about this transfiguration. (That is, not just waiting and hoping.) This is what resonates in Benjamin’s thought with the Jewish messianic tradition, although that doesn’t necessarily authorise a Talmudic approach to Benjamin’s text. Indeed, caution is required in dealing with Benjamin’s theology. The divine, in ‘Critique of Violence’, is everything which stands in absolute opposition to the mythical: ‘Just as in all spheres God opposes myth, mythical violence is confronted by the divine. [...] If mythical violence is law-making, divine violence is law-destroying.’ (150). I might add: this also is myth. Turning now to the situatedness of Benjamin’s meditation, it would be nice to be able to give you clear and concise overview of the political and social conditions in which Benjamin wrote. Perhaps at least as instructive as we go on to discuss recent interpretations of ‘Critique of Violence’ might be to consider, in contrast, our situatedness as readers. Where we are today, in a peaceful Europe, we have little reason to fear a general mobilisation to war, an outbreak of proletarian revolution or class conflict. While organised labour threatens no more than occasional inconvenience, we have much to benefit from the state’s organisation of unemployment (not to mention the decimation of manufacturing industry, informalisation of labour etc. ), including the expansion and extension of higher education as embodied by the Jan van Eyck Academie. We are hardly concerned with anti-Semitism, which has gone out of fashion amongst our class besides being officially repressed along with the consciousness of the destruction of European Jewry which began not long after Benjamin wrote. We experience prejudice mainly as privilege and consider our protection from racist violence and criminality in general as a right. The war supposedly ‘to end all wars’ which ended in 1918 left Germany in a state of political confusion and violence which we would sooner associate with present-day Iraq than modern Europe. But it isn’t the parallel with another state which has recently suffered a military defeat, mass-demobilisation and the deposition of an autocratic ruler which matters. The question is, what is the possible relation between the abstract considerations of violence — with their legendary exemplars — and the reference Benjamin makes to ‘contemporary European conditions’ (135) — which would have needed no illustration in 1921. Benjamin was not alone in perceiving a historic chance when the ancien régime quit the scene. The Emperor abdicated on 9 November 1918, when revolution threatened to succeed mutiny. 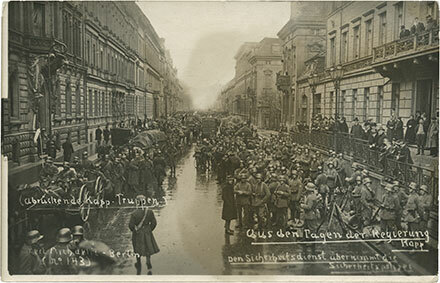 Within hours, two republics were declared, bringing the split over support for the war which had divided German socialists in 1914 into an open, violent contest for the state. In an attempt to forestall the revolutionary forces which might have been stirred by the intended announcement of a constitutional monarchy, and to secure the succession of the SPD, Philipp Scheidemann declared the first German republic from the balcony of the Reichstag. This half-hearted republic was Scheidemann’s own initiative, but could not be revoked. Karl Liebknecht meanwhile proclaimed a ‘free socialist republic’ from the balcony of the Royal Palace itself and pledged revolution. The showdown came in January 1919 with the so-called Spartacist Uprising, which proceeded, with KPD and USPD backing, from the occupation of buildings by workers to mass demonstrations and general strike. Without a clear plan, this revolution failed because of disputes among the leadership concerning the use of violence and ultimately because the workers were no match for the paramilitary forces unleashed to crush them. The government deployed Freikorps troops mustered by former army staff to suppress communist uprisings throughout Germany. The Freikorps have been variously described as private armies recruited by former generals, anti-republican paramilitary organisations, freelance right-wing militias, gangsters of the extreme Right, and, the men who could not be ‘debrutalised’ after the war (according to Hermann Göring). They carried out their (quasi-police) work with enthusiasm and savagery and without effective political control. Famously responsible for the abduction, torture and murder of Liebknecht and Rosa Luxemburg following the failed January Revolution — a failure still celebrated in Berlin today — the Freikorps had a hand in hundreds political murders perpetrated without fear of the law. In contrast, left-wing militants were pursued and severely punished by the judicial authorities as well as by right-wing thugs. The SPD-led government signed Treaty of Versailles and thus got the blame not only for the onerous and humiliating terms of the treaty, but for Germany’s defeat itself, which conservatives and militarists (who had started and lost the war) attributed to a ‘stab in the back’. The government had no power to disband the Freikorps militias as the peace treaty required and indeed still relied on them to repress left-wing agitation. In 1920 the Freikorps staged its own coup d’état — the so-called Kapp Putsch — which, when the regular army refused to intervene, was answered by a general strike such as the SPD had failed to call in 1914. Walther von Lüttwitz’s Marinebrigade Ehrhardt which was the force behind the coup withdrew from Berlin (apparently leaving a bloody wake) and was nominally dissolved. 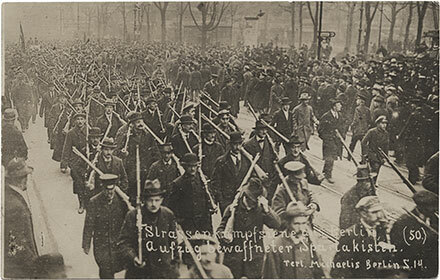 Freikorps militias however continued to be active in suppressing left-wing activities both on behalf of the government and on their own initiative. Many former Freikorps soldiers graduated to the Nazi SA, which, though officially formed in 1921, has its roots in the reform of the Freikorps. To this outline of major trends in political violence between 1918 and 1921 when Benjamin wrote his ‘Critique’ could be added snapshots of economic insecurity resulting from blockade, unemployment and the beginnings of hyper-inflation which threatened workers and the middle-classes equally. In the absence or crisis of legitimate authority and in the face of opportunity — for some — and poverty and hunger for many, non-political violence and criminality flourished. This was reflected at the extremes in the popularity of lurid cultural expressions or celebrations of violence — often with sadistic and sexualised overtones — and in cases of true-life Sweeny Todds. Arguably, the confusion Benjamin perceived in contemporary conceptions of violence (whose ramifications threatened him personally) has its roots in Romanticism. Resistance to Romanticism is the oblique polemical force of ‘Critique of Violence’, for it is Romanticism which unites the failure of revolutions with the cult of death in a repetitious cycle without even dialectical hope. The Romantic revolutionary’s dreams are fulfilled in martyrdom while the cult of death demands sacrifice, not transformation. The failure of revolution is required and celebrated by the cult of death whose hunger for victims is attested by the empty tombs which punctuate the urban landscape of Berlin today.